I’m a big fan of skiing, even if I haven’t been for a while. So when Jess and I were invited to experience skiing in Spain, specifically the Spanish Pyrenees region near to Barcelona and Girona, naturally we leapt at the chance. Jess doesn’t ski, but enjoys the snow, and we built an itinerary around skiing, winter activities, and exploring some of this beautiful area – sampling four of the main resorts in the Spanish Pyrenees near to Barcelona. From those adventures, Jess wrote a post all about enjoying a ski holiday as a non-skier. 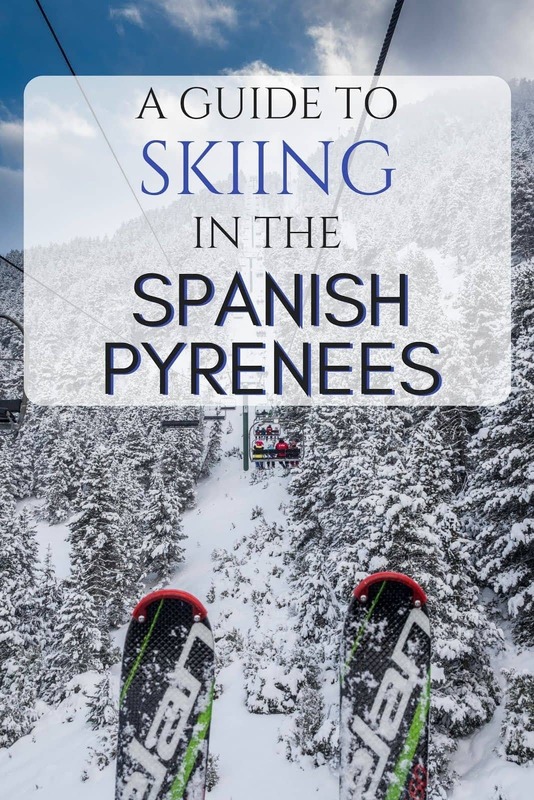 In this post, I’m going to be sharing with you my experiences skiing in the Spanish Pyrenees. A bit of background – I’ve skied a fair bit in my life, in the USA, Austria, Italy and France. I enjoy all the aspects of skiing, from the stunning views through to the après ski (and of course, the actual skiing itself!). In all my years of skiing, I’d never considered the Spanish Pyrenees as a destination. This, it turns out, was a major oversight on my part. Let’s find out why! 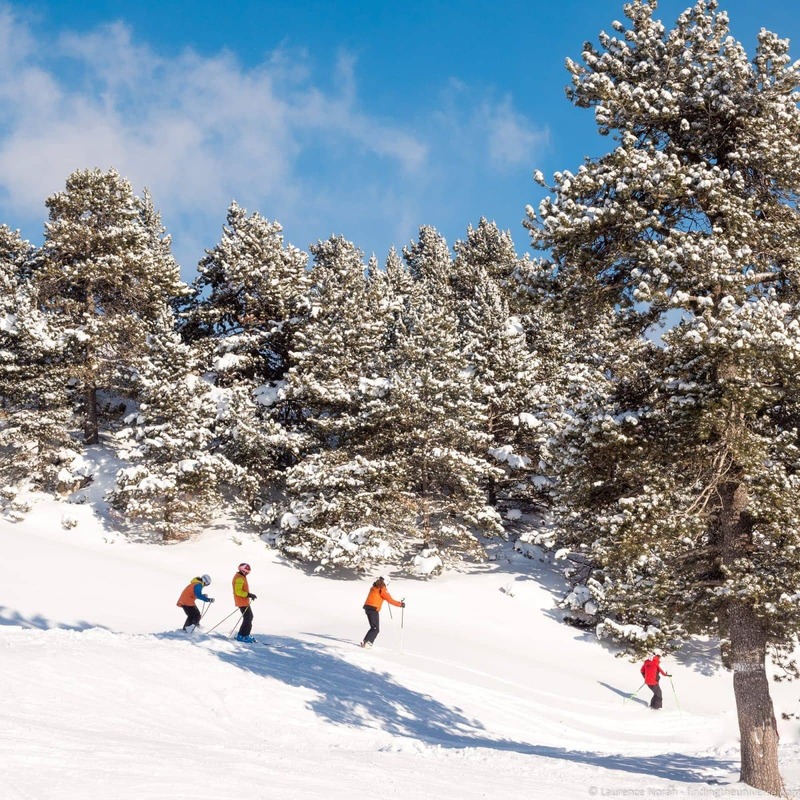 Where Can You Go Skiing in Spain? Why Ski in the Spanish Pyrenees? When Is the Ski Season in Spain? First, let’s talk about where you can ski in Spain. The majority of skiing locations are to be found in the Spanish Pyrenees – the mountain range which divides France and Spain. There are almost 20 skiing areas in the Pyrenees, so lots of choice. 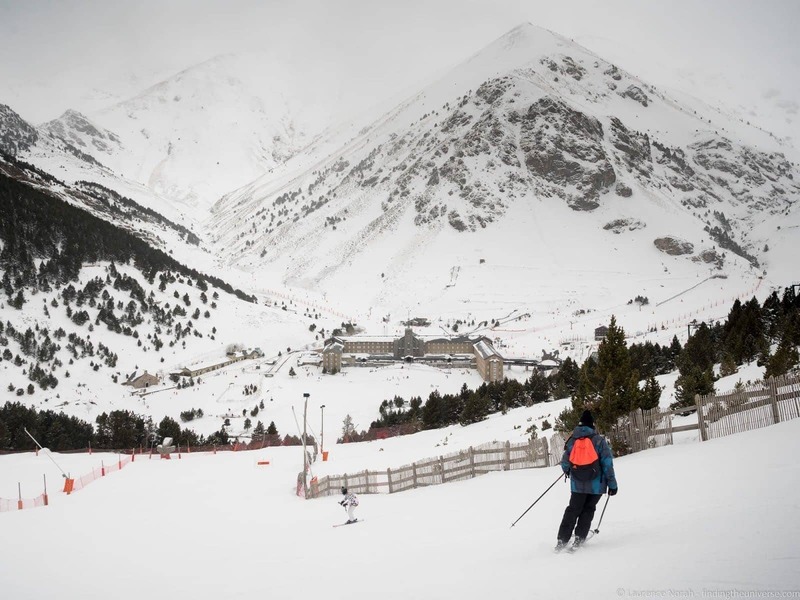 There are other locations in Spain that you can ski, including the Cantabrian Mountains (6 locations), Sistema Central (5 locations), the Iberian Mountains (3 locations) and the Sierra Nevada, home to 1 ski resort, which is also Europe’s most southernmost ski resort. In this post we are going to focus on the five ski resorts located in the region of Girona, all of which are within a 2 – 3 hour drive of Barcelona, making them easy to access from across Europe. The Spanish Pyrenees offer a wide range of ski resorts to suit every taste. Whilst not perhaps as well known as other areas of Europe, they have excellent snow, offer great value, and are easy to get to. 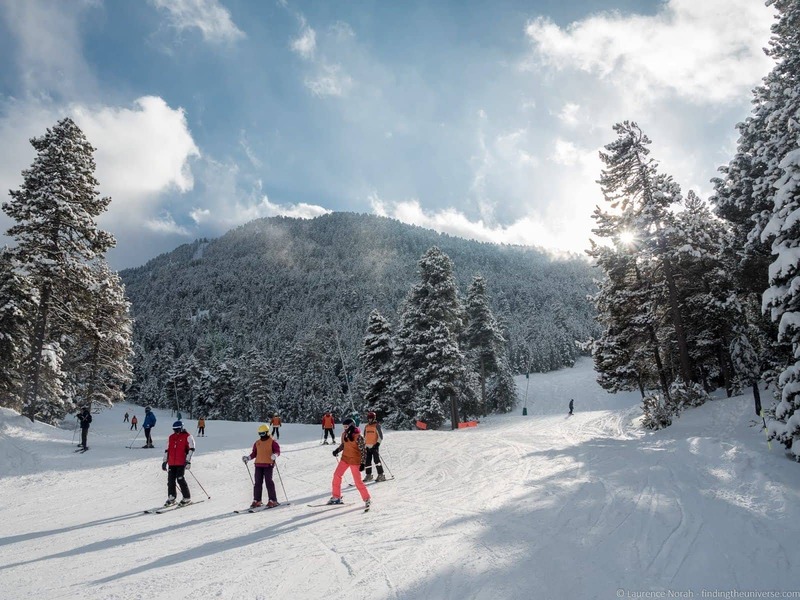 Two of the resorts we visited, La Molina and Masella, are known as being the sunniest ski resorts in Europe, so if you’re a fair weather skier, these are a good option to head for. The resorts that we experienced, in the Catalonia region, are beautifully picturesque and easy to get to – most are within a two hour drive of Barcelona. You also get to experience fantastic Spanish food, prices are reasonable, and they aren’t too busy either! For families and beginners, I’d say the Spanish Pyrenees are perfect. There are lots of introductory slopes, ski instruction is reasonably priced and there are a lot of ski schools to choose from. One of the resorts we visited is also perfect for those physical or mental health needs, being fully equipped for accessible skiing. Resorts are open from November through to April, however the best snow is usually best January or February. Days are longer in February, so that is often a good month to come. Weekends are usually busy, as locals head out of the cities and up the mountains, so if you want quieter slopes, aim for the weekdays. If you want a more lively feel come during the weekends. There is often special entertainment and more activities on offer on the weekends – plus some of the resorts offer public transport to and from major cities on the weekends. So that’s the where, why, and when. Now I’m going to share with you the four ski areas and resorts that we visited plus a fifth that is for those who are Nordic or cross-country skiers, to help you make a decision as to which ones might be best for you. 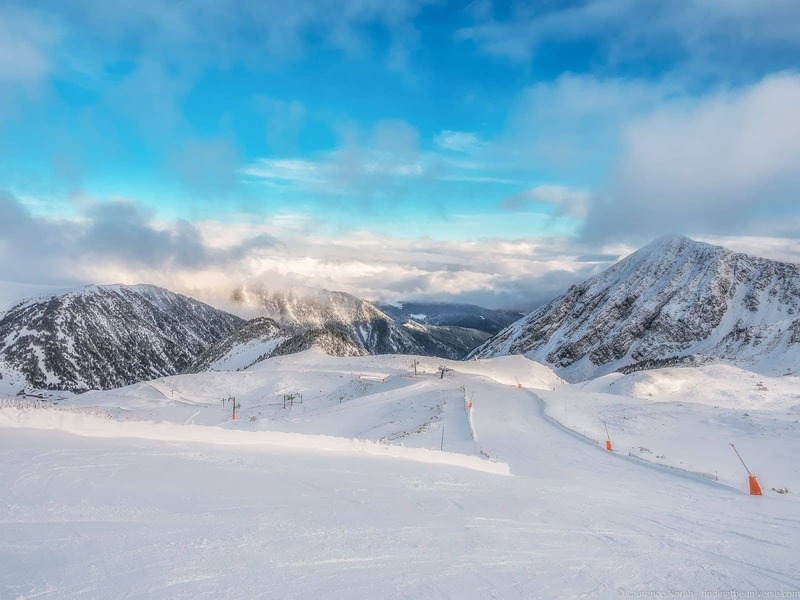 Whilst there are around 20 total ski resorts across the Spanish Pyrenees, our guide focuses on the 5 resorts that are in the Girona region, making them easy to access from both Barcelona and Girona, which have great transport links. 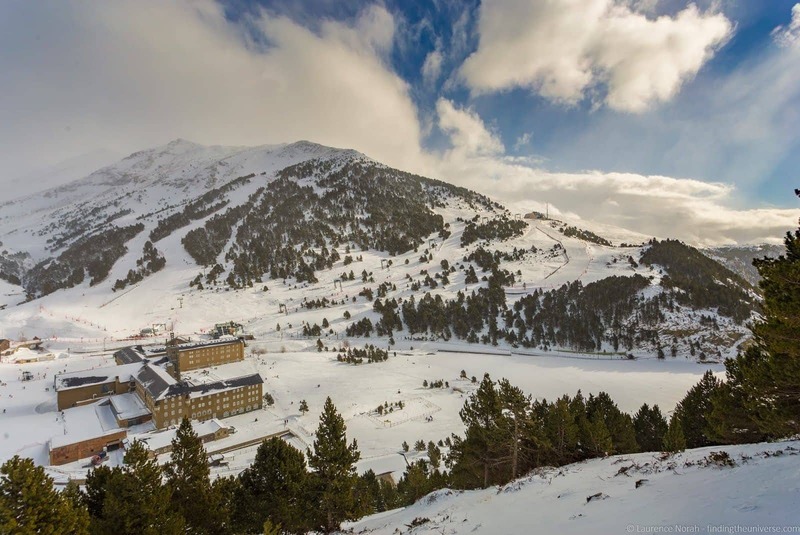 Found at the top of an epic 12km long switchback road, Vallter 2000 is the only resort in this list that doesn’t have some form of on-site accommodation – unless you’re in a campervan, in which case there is some allocated parking available for overnight stops. It’s not a huge ski resort, with 17 slopes across 18.7km of piste, ranging from green to red in difficulty. It offers up spectacular views across the Pyrenees though, and the café at the top of the slopes is well worth stopping at for the view from 2,535 metres. As well as skiing / snowboarding, there’s also a children’s play area, snowshoeing and snow tubing, plus four bars and restaurants. My suggestion is that Vallter 2000 is a great one-day skiing option. It’s a 2 hour drive from Girona (3 hours from Barcelona), and there is in fact a bus that runs here from Girona on the weekends. If you can make it here under your own steam, I’d suggest avoiding the weekends if possible, as these are the busiest times usually. I visited on a foggy and grey Thursday, and there were probably less than twenty people across the whole resort. My guide explained that most people come up from the cities for the day, and if the weather isn’t good, they’ll stay home and wait for better weather. I persisted through the whole day (with regular hot chocolate stops, admittedly), and my efforts were rewarded in the last hour, when the sun gloriously broke through the mountains, and I had the whole place to myself. That was a magical moment that I won’t forget for a while. As mentioned previously, with the exception of campervans, you can’t stay on site. There are a number of towns nearby, including Camprodon and Setcases, where you’ll find lodging options. We stayed in Hotel Resguard del Vents, in Ribes de Freser, which at 90 minutes is quite a drive, but still feasible for a day trip. You’re going to want a car to make your way up to the mountain though. The Vall de Núria is quite unique in terms of ski resorts, in that there’s no vehicular access to it. Instead, you have to park in one of the villages at the bottom of the mountain, and then take a special rack rail train up the mountain. This is a beautiful ride in of itself, and well worth doing even if you aren’t going skiing. Tip: sit on the right side of the train as you go up the mountain for the best views. At the ski resort itself there’s a large building which serves as the main resort hub, with accommodation, equipment hire, restaurants, a cafeteria, and an information centre. It’s an important site of religious pilgrimage as well, so has more to offer the visitor than just winter activities. We enjoyed walking around the area and visiting the little church, as well as visiting the informative centre which went through the history of the valley (although most information is in Spanish and Catalan). On to the snow activities. Vall de Núria doesn’t have a huge skiing area, with 11 runs and 7.6km of slopes. 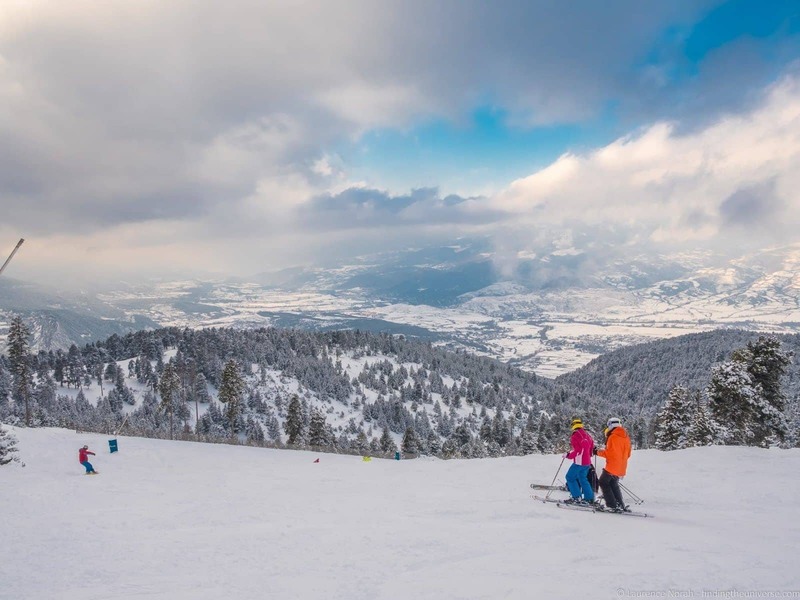 However, it’s the perfect place for families and folks learning to ski, with on-site accommodation, a children’s play area with snow tubing and sledding, plus there’s a tour operator on site offering snow shoeing expeditions – something we very much enjoyed doing. You can even go ice scuba diving in the lake if you’re so inclined – not something you see very often! I’ve visited the Vall de Núria before, on a 2012 trip to the Spanish Pyrenees. That time though, I visited in summer, so it was lovely to see it in winter, all covered in snow. I enjoyed the skiing here as well, although there aren’t too many slopes, so if you’re hankering for variety this might not be the place for you. We just enjoyed all the activities available to us as well as the skiing (my sledding skills need a bit of work! ), and would definitely recommend spending a night here. If you do, we think the full-board and half-board options are probably the best value. 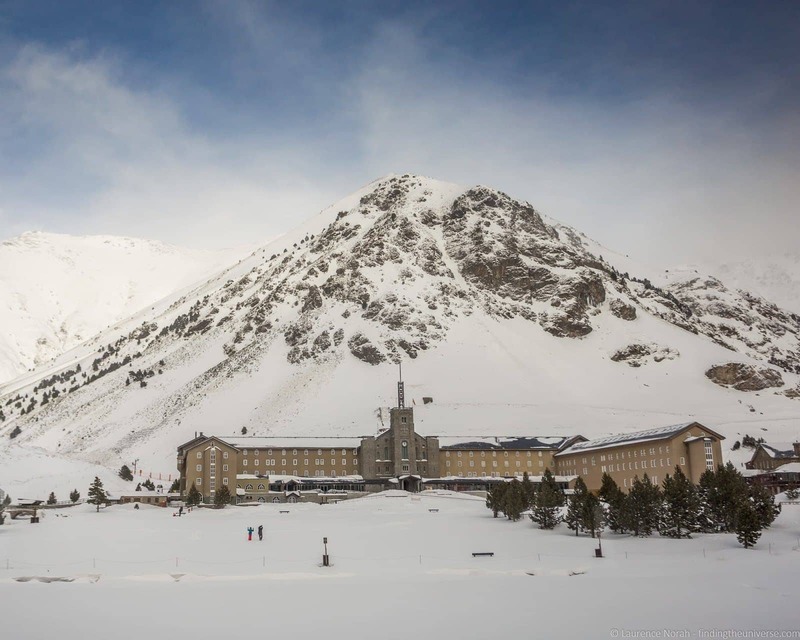 As I mentioned, we stayed in the three star hotel in the main building at Vall de Núria, which gave us easy access to the slopes. They have a variety of room types available, as well as a number of apartments which come with their own kitchen and dining room should you prefer to self cater. There’s also a hostel, the Alberg Pic de l’Àliga, 1km up the slopes and accessed by cable car, which offers excellent value for money. Alternatively, there are a number of hotels and apartments in Queralbs and Ribes de Freser, from where you can take the rack railway up to the slopes. Now for a more traditional ski resort. 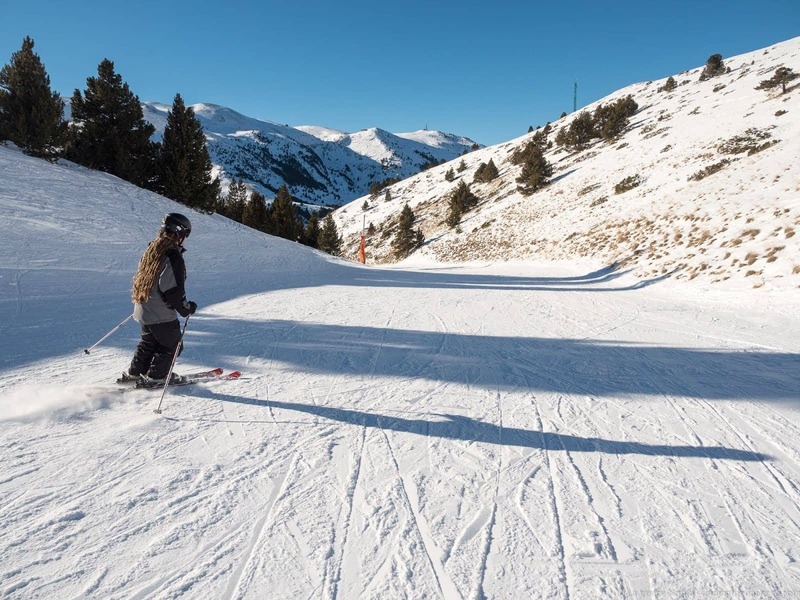 A couple of hours drive from both Girona and Barcelona, La Molina is a relatively large ski resort village and is home to the oldest ski slopes in Spain. There’s a lot to do here. As well as the 68km of piste across 63 slopes, there’s snowtubing, snowshoeing, bowling, ice-skating, snowmobiling – and even winter Segway tours! There’s even an adventure park, which offers zip lines, tarzan jumps, and all sorts of high wire devilry with courses designed for both children and adults. I’d say La Molina is the perfect spot to come on a family or group trip where you have skiers and snowboarders of different levels and abilities – and even with folks like Jess who don’t ski or snowboard at all. There’s loads to do off the slopes as well as on – we had a lot of fun in the adventure park, Segwaying, and snowshoeing, and I loved the variety of slopes to choose from when I went skiing. Speaking of skiing, with 63 slopes to choose from, I certainly didn’t have time to try them all, and experienced skiiers will find plenty of variety on the slopes. 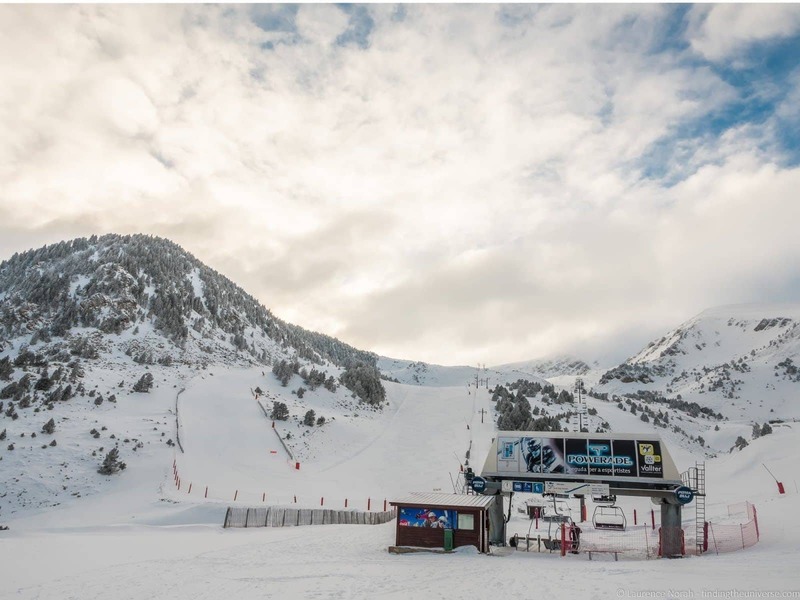 Plus, La Molina is linked to the next-door Masella ski resort, and if you purchase an ALP 2500 pass, you get access to both slopes – doubling the amount of piste available! 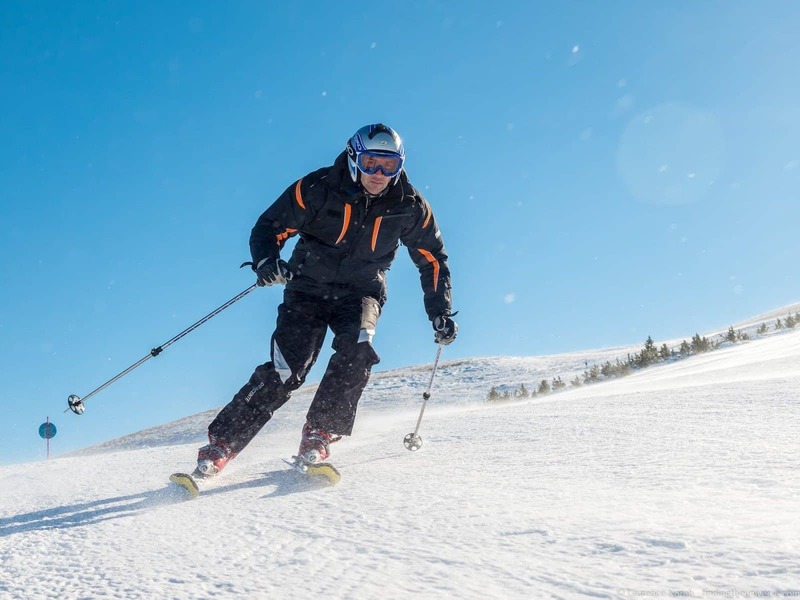 La Molina is also the best place to come if you have reduced mobility – they have a fully adapted sports centre with a wide range of equipment, plus instruction for those looking to learn how to ski. We saw this in action, and were very impressed by the facilities available. They can help adapt equipment to people with a very wide range of physical handicaps as well as mental health issues, so that almost anyone can experience the sensation of skiing, and, depending on ability, learn how to ski for themselves! La Molina and Masella are serviced by a SkiBus from Barcelona. This service offers round-trip transport to La Molina or Masella from Barcelona, as well as a ski pass and skiing insurance. There’s also the option to book your skiing equipment as part of the ticket. Book your ski day trip from Barcelona here. There are plenty of accommodation options to choose from. 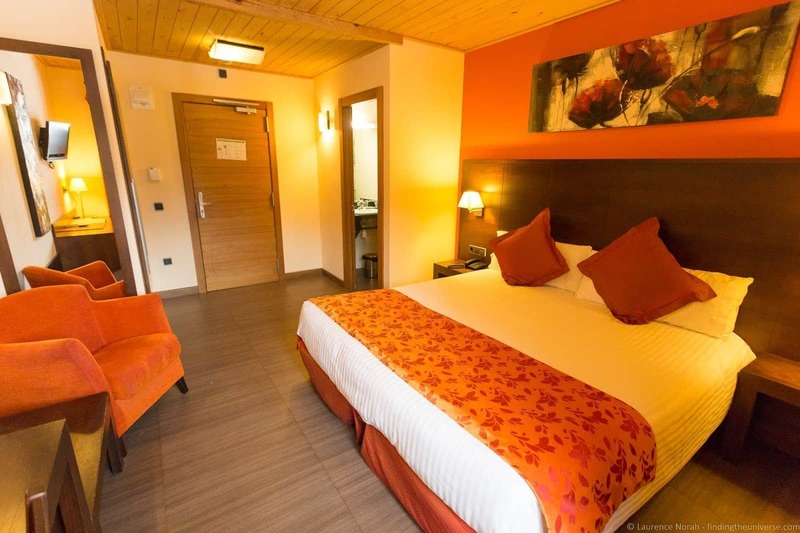 We stayed in the Hotel Solineu, which was a 5 – 10 minute walk from the main ski lifts, and had everything we needed, from an excellent on-site pizzeria through to a hot tub and sauna. Overall, we’d suggest La Molina is a great stop if you’re looking at a longer trip and want to be based in a single location with a lot of variety and activities to choose from. Next on my list of ski resorts in the Spanish Pyrenees, is Masella. 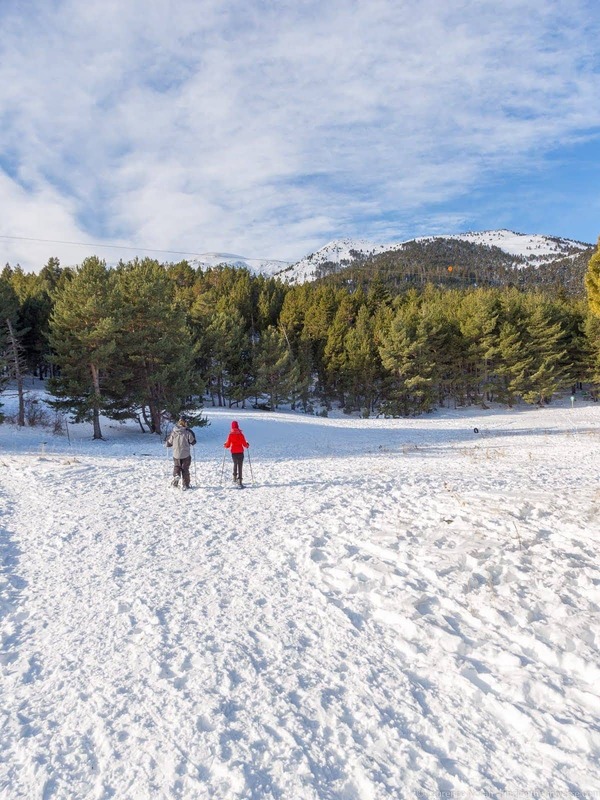 This is a short, ten minute drive from La Molina, but has its own extensive range of slopes – 65 of them in fact, covering 78km, the most of all the resorts in this round up. That means you have a lot of slopes to choose from, and with 18 ski lifts, plenty of options for getting about the mountain. It’s a resort that is more focused on the skiing and snowboarding though, whilst there is a children’s area, there’s no dedicated sledging or snowtubing – or other activities that you might find. For people who love to ski and snowboard though, Masella is brilliant. 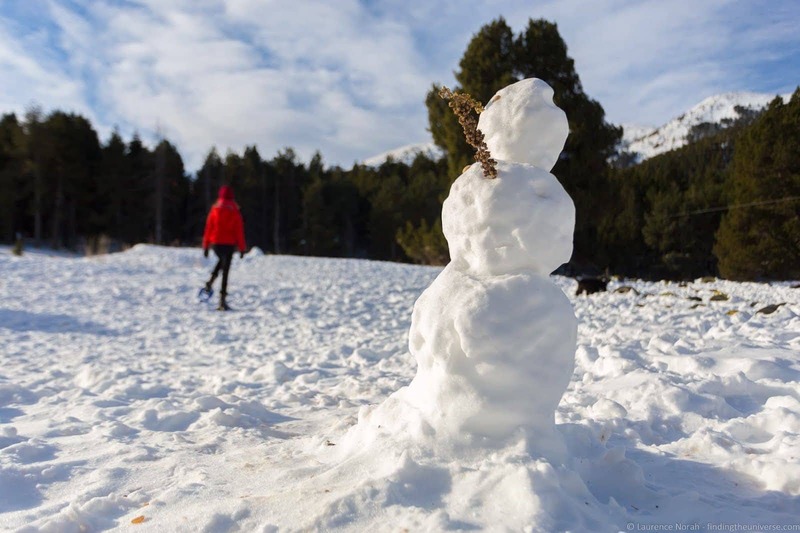 La Molina and Masella have the most sun of any ski destination in Europe – towards the end of the season its not uncommon to see people skiing in vest tops! 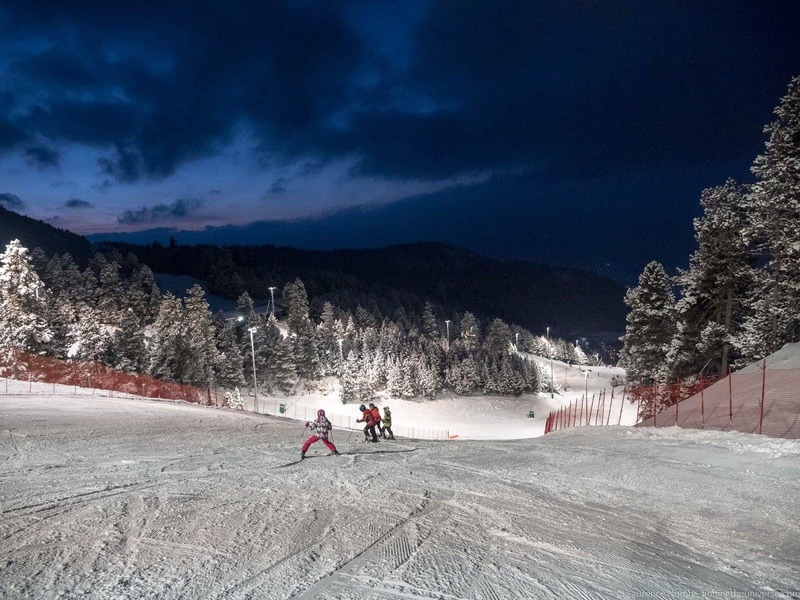 The other unique selling point of Masella is the night skiing, on Thursdays, Fridays, Saturdays and holidays, 10km of the slopes are floodlit for 2- 3 hours, meaning you can keep skiing after dark! I’ve never skied at night before, and this was a truly unique experience. The floodlights are so bright that visibility is excellent, and I really enjoyed myself. One word of warning – after the sun goes down the temperatures can really drop, so make sure you wrap up really warm if you’re going for a night skiing option. I’d definitely recommend some form of face covering as well, to protect your skin. Night passes are available separately to day passes – I’d suggest this is a worthwhile investment for something a bit different. 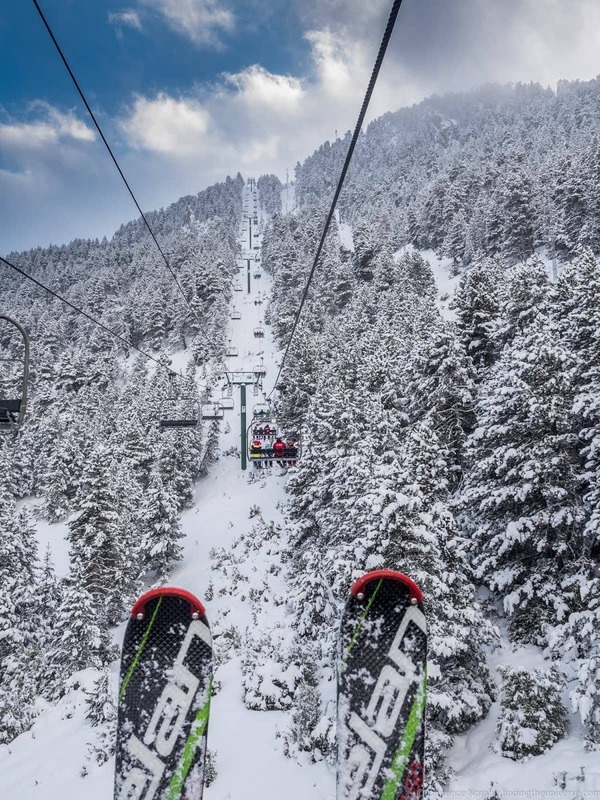 Otherwise, Masella is a resort more focused on the pure skiing and snowboarding experience, so will likely appeal more to folks who are either looking to focus on learning, or already know the ropes pretty well. And of course, you have access to La Molina with the ALP2500 pass as well, and the previously mentioned ski bus service from Barcelona will let you come here for the day. There is some accommodation available, but it’s not as extensive as La Molina. There are two hotels on site, plus apartments. Otherwise there’s accommodation in La Molina and Puigcerdà, and we were staying at Hotel Solineu in La Molina when we visited which is a ten minute drive away. Last in my list of resorts in this area of the Spanish Pyrenees is Guils. We didn’t actually visit Guils, because they only offer Nordic style skiing, which isn’t something either of us do. However, if you enjoy cross-country skiing then Guils is definitely an option to consider. They also offer winter cycling on specially designed “fat-tyre” bikes, which looks like a unique experience! As a guide to help you figure out where all the above are in relation to each other and major cities like Barcelona, we’ve put together the below map, which you can also see on Google Maps here. We had a lot of fun in our ten day period of skiing and exploring the Spanish Pyrenees region in winter. It opened my eyes to the possibilities of skiing in Spain, and some of the awesome resorts and facilities that are available. I’ll definitely be recommending this part of the world to people looking for a snow experience outside some of Europe’s more well known destinations – the prices are great, access is easy, and there’s loads to see and do. If you’re heading to Girona, see our guide to things to do in Girona. Fans of the artist Salvador Dali will want to visit some of the sites associated with the artist in the region. See our guide to Dali Sites in Costa Brava to help you put together your trip. A fantastic experience we can recommend to anyone visiting this region is to take a hot air balloon ride. We’ve done this twice, and you can see our guide to hot air ballooning in Costa Brava here. We have a guide to things to do in Palamós, one of our favourite fishing towns in the Costa Brava as well as a guide to things to do in Besalu, a lovely medieval town. We have a detailed guide to the Spanish Pyrenees, as well as detailed guides to all the specific regions of the Girona Pyrenees of Catalonia, including La Garrotxa, El Ripollès and La Cerdanya. 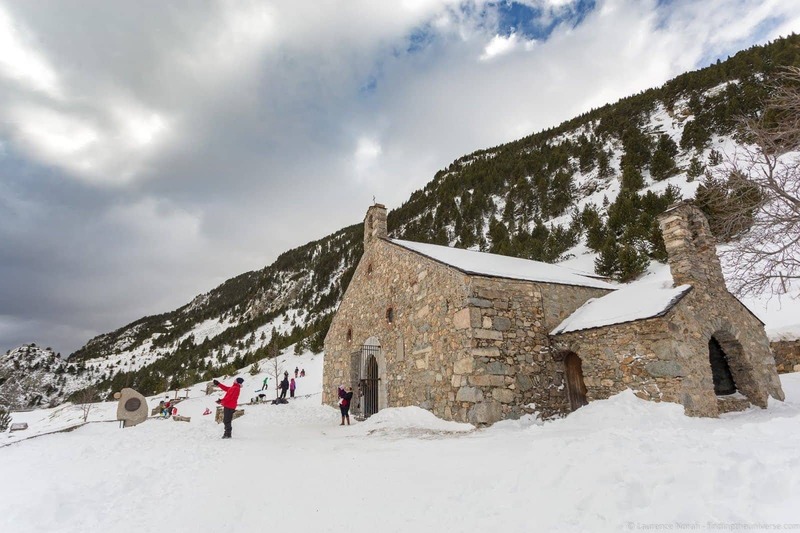 We also have a guide to visiting the Vall de Nuria, which covers both summer and winter. If you’re going to be spending time in Barcelona, check out our 3 day Barcelona itinerary, our guide to spending a day in Barcelona, our review of the Barcelona Pass, and our detailed guide to Gaudí in Barcelona to start you off. Finally, we suggest you take a look at our guide to what to pack for a ski holiday so you know what to bring with you! 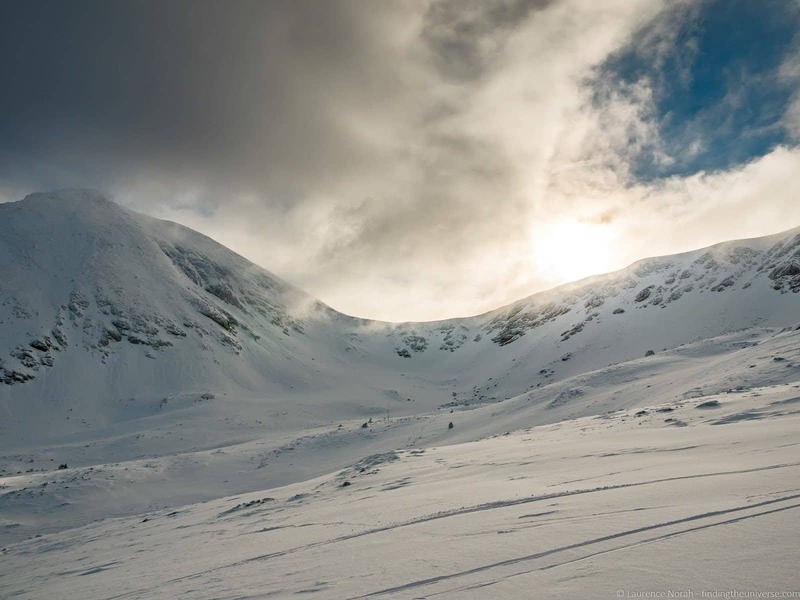 Have you ever skiied in the Spanish Pyrenees or in Spain? Would you consider doing so? Let us know your thoughts, questions and experiences in the comments below! So you know: Our trip to the Spanish Pyrenees was in partnership with the Costa Brava tourism board who covered all our flights, transport accommodation, meals, equipment hire, and activities. As always, word and thoughts remain our own. Check out our code of ethics for more on how we work with brands.